Kaprosuchus saharicus is one of five 100 million year old fossilized "monstrous and surprisingly diverse" relatives of the crocodile recently found in Niger and Morocco. The 6-meter-long animal had an armoured snout for ramming its prey and three sets of tusks for ripping flesh. Science magazine comments that "each of the five ancient animals could have answered a casting call for Star Trek". But Kaprosuchus would have resonated with the medieval and ancient imagination too, combining as it does attributes we associate with a dog, a boar, a crocodile and a dragon. P.S. 23 Nov: the crocs have been given nicknames. The biggest is SuperCroc. PancakeCroc had an impressively flat head. 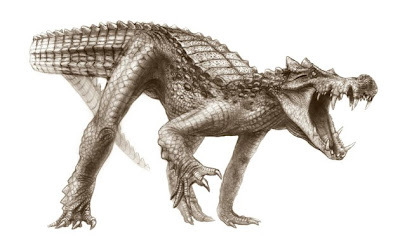 BoarCroc (Kaprosuchus saharicus) had fierce-looking fangs and an armored snout for ramming. DogCroc had a fleshy nose like a dog and was limber enough to gallop. DuckCroc had broad, overhanging snout resembling a duckbill. And RatCroc had a pair of buckteeth in the lower jaw that were used to dig for food.